What did the 2012 Olympics tell us about who we are, who we were, and who we want to be? This book takes 2012 as a starting point for a debate on national identity, community cohesion, urban regeneration and the persistence of inequalities in British society – from the vantage point of East London not only as the main Olympic venue but also as the main argument why Britain won its Olympic bid. Part one sets the scene, exploring the changing social and physical landscape of East London from the inside – including voices from East London communities and the Olympic Park workers – and from the outside – in the imagination of artists, social commentators and reformers who made the area into an object of public fascination and concern. 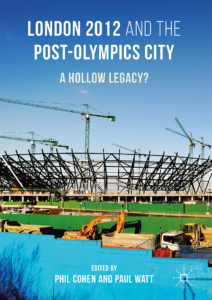 The second half of the book examines the strategies that were used to present an ‘Olympian’ vision of London to the world; it focuses on the rhetoric and reality of regeneration and the cultural politics of staging the event, pinpointing the differences that East London and the Olympics have made, and will continue to make, to one another. The legacy politics of 2012 are examined in the light of the debate about moral and market economies recently inaugurated by theorists of the Occupy movement. 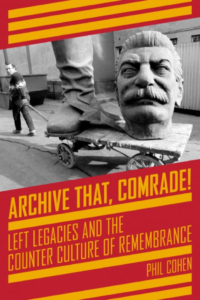 The book includes a photo essay on the Olympic site, original photographs by Jason Orton, Ian F. Rogers, Loraine Leeson and Peter Dunne, and John Claridge; artworks by Aldo Katayanagi, Jake Humphrey, and Jock McFadyen; cartoon by Julian Wood and maps by William Dant and John Wallett. The cover is a specially commissioned photomontage by Peter Kennard and Tarek Salhany. The book is supported by an online gallery of images and other Olympic materials for further study. Phil Cohen grew up with Steve Ovett and Jean-Paul Sartre as his teenage heroes and has been trying to get them into the same book ever since. He is author of Knuckle Sandwich: Growing up in the working class city (with Dave Robins); Rethinking the Youth Question; London’s Turning: The making of Thames Gateway (with Mike Rustin); and Borderscapes: memory, narrative and Imagined Community (to be published in 2013). His poetry has been published by Critical Quarterly, Agenda, and Soundings. 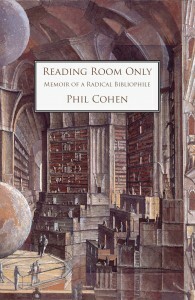 A memoir Reading Room Only: memoirs of a radical bibliophile is forthcoming. He is Emeritus Professor in Cultural Studies at the University of East London. This gallery of 120 images in Body Politics contains the following sections: Elemental Labour-Mummers, miners and sweeps-Time and Motion Studies-Automata- Youth culture and extreme sport-physical culture and the dream of the collective body- masculinity and manual labour in a post industrial world.It is designed to support ‘On the wrong Side of the Track?’ and ‘Borderscapes’. On the Wrong Side of the Track? 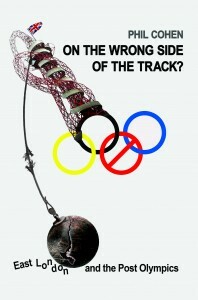 is a composite of social history, social critique and cultural response to London 2012 organised around two parts. The first part,‘East London in transition – an everyday story of ‘race’, class and imagined community’ (pp. 35–133), provides a contextually rich, social historical background to the formation over a long duration of the geographical location of the 2012 Games. The second part, ‘The 2012 Olympics: between the artificial paradise and the beautifying lie’ (pp. 135–363), features critical commentary on the Games themselves (especially the opening and closing ceremonies): a photographic essay,35 oral testimonies and life stories from research that Cohen has conducted in East London over the past decade and half. Three attractive bonus features of the book,for this reviewer, are the author’s collaboration with 13 artistic contributors (which leads to the inclusion of numerous original photographs), nearly 40 pagesof notes and further readings and a guide to online resources, accessible at www.philcohenworks.com, that includes the outline of an undergraduate course on‘London Olympic Cultural and Urban Studies’. Cohen adopts what he calls a ‘Para-Olympic perspective’ (pp. 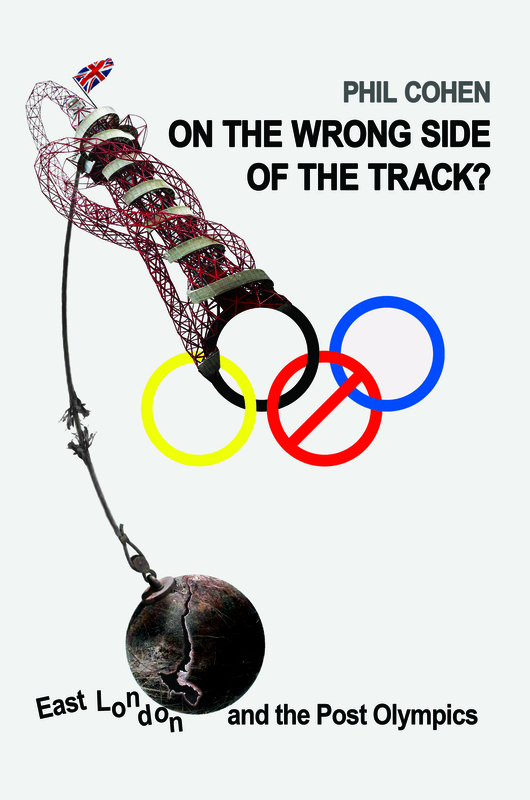 20–22) as ameans to try to move beyond being for or against the Olympics. He adopts this position in the same way that standpoint epistemologists adopt a ‘third space’; a conceptual ‘position that is properly dialectical and moves beyond either/or both/and types of argument’ (p. 21). It also necessarily requires ‘an active dialogue between disciplines’ (ibid). How successful this perspective is remains for fuller discussion elsewhere, but it does allow Cohen to identify certain key themes for critical discussion. These include analysis of the representations of East London and its inhabitants, including a ‘generation of budding twenty-twelvers’ (p. 108), as an imagined community. Through consideration of the ‘gothic imagination’ framing much of the scholarly and fictional discourse about East London – as he notes ‘as a general rule the further east you go the drabber the portrait becomes’ (p. 71)– in literature as well as amongst urban planners, in contrast with ideas stemming from people from docklands and the Isle of Dogs, Cohen is able to outline how the latter have responded and created instead a ‘form of symbolic ownership and control that was, in material terms, largely denied them’ (p. 67). ‘Academic and writer Phil Cohen has been taking the pulse of east London and its Essex hinterland for a long time now, so the 2012 Olympics provided him with the perfect observation deck for a new series of thoughts as to the likely shape and future of the territory in the years to come. 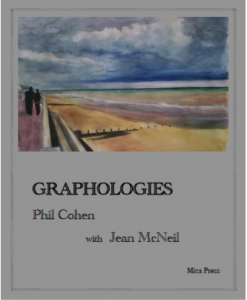 Complex though some of his formulations are, he is always worth attending to, and in his latest collection of essays, On the Wrong Side of the Track? East London and the Post Olympics (2013), he gathers together what is in many ways an East London version of Humphrey Jennings’ great work, Pandaemonium, which was the inspiration behind the Olympic opening ceremony created by Danny Boyle and Frank Cottrell Boyce. A mixture of ethnography, documentary, oral history, cultural theory and sporting politics, Cohen ranges widely across the disciplines to try to understand what lies ahead for 21st century London east of the Lea.